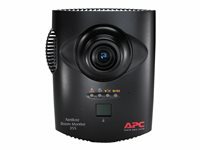 The APC by Schneider Electric NetBotz® Room Monitor 355 functions as the central hardware appliance for a NetBotz security and environmental monitoring system. The Room Monitor 355 can be installed anywhere in a room and includes an integrated camera and internal sensors that monitor temperature, humidity, dew point, air flow, and motion. It also includes four sensor ports for connecting temperature, humidity, smoke, door, vibration, spot fluid, and third-party dry contact and 0–5 V sensors. Image processor that generates images up to 1280 x 1024 resolution, 24-bit color, and up to 30 frames per second. 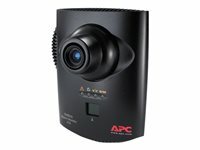 NOTE: The maximum frame rate describes the maximum number of images that the camera imager is capable of producing each second. The actual frame rate is dependent on the amount of available bandwidth and current resolution. Image Size: 7.7 mm x 6.1 mm (9.82 mm diagonal = 0.39 in). Field of View: 64º (H) x 53º (V) for all resolutions. User adjustable and switchable industry-standard CS-mount lens. CS-mount permits access to hundreds of different general purpose and special purpose lenses. Total Cost of Ownership Browser Accessible - View the user interface with a browser. Provides quick access from anywhere on a secure network. Access monitoring Detect access by unauthorized personnel via door switch. Environmental monitoring Prevent equipment failure from a full range of threatening environmental conditions. Surveillance Detect and record motion, allowing a visual record to be paired with an access or environmental alert, which speeds root cause analysis. Customized escalation policies Alerts are managed according to your escalation policies and received in multiple formats. Password security User-selectable password protection prevents unauthorized access. Advanced view client application Robust appliance interface provides historic alerts, graphs, and configuration. Enterprise management system compatible Manage your APC devices from a single system by forwarding SNMP traps (events) to your preferred enterprise management system. Alerts view Easily review and correlate alerts. Provide context to alerts by attaching video clips, graphs, and maps.